Isharann Tidecaster - Colour palette. 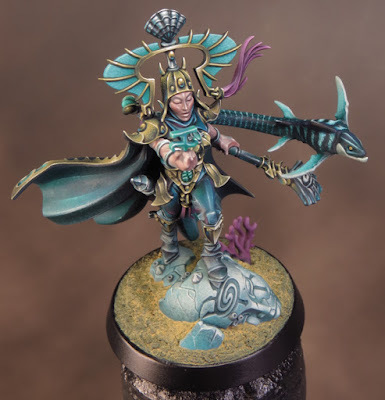 It became clear to me that I was not going to get my Tidecaster finished in time for the Golden Demon Age of Sigmar event at the end of June. 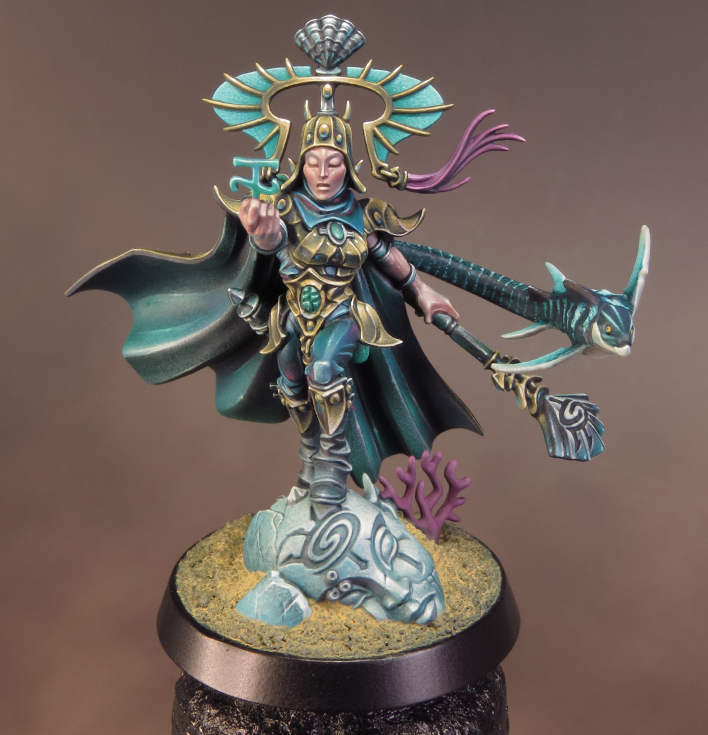 To my own surprise I was OK with this because I'd rather finish her properly in my own time and to the standard I want. I had a great time at the Open Day. I wasn't sure how I would feel, attending and not competing, but it meant I was far more relaxed than usual! I was able to enjoy meeting up with everyone and having a good old natter. It was nice not to have thoughts of 'how have I done in the comp?' running through the back of my mind all day. 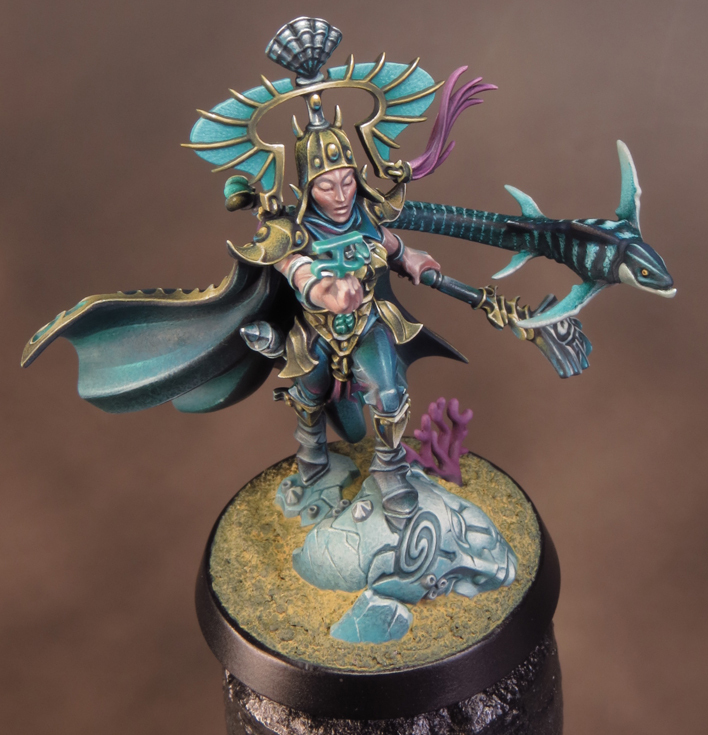 The Tidecaster is now, in spite of the hot weather messing up my painting, very nearly finished. Before all is done I thought I’d share my thoughts about the colour palette I’ve used. The colours used on my Tidecaster’s costume are primarily blue/green and gold. 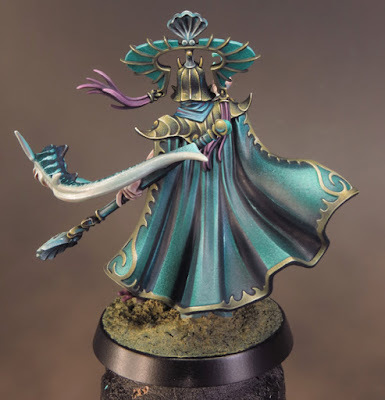 This could very easily look like a traditional High Elven colour scheme so the challenge is to give it a sinister twist suitable for the Idoneth Deepkin. I’ve tried to do this by keeping the colours dark and cold. That seems like an appropriate approach for a race who dwell in the cold inky depths. The first step in achieving the desired atmosphere is the selection of my global highlight and shade colours. I would usually feature a warm/cool contrast in these colours but in this instance both colours have a cool hue. My global shade colour is a dark green/blue. I often pick Vallejo Dark Sea Blue for this but I wanted a matt finish so I have mixed an equivalent colour myself. The dominant colour group on the Tidecaster is a range of blues and greens. Within this range I’ve used a variety of colours to suggest the shifting blue and green tones of an undersea environment. 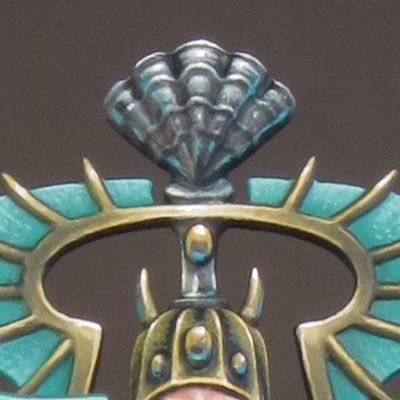 These colours have been used on the cloak, statuary, costume and the fish. 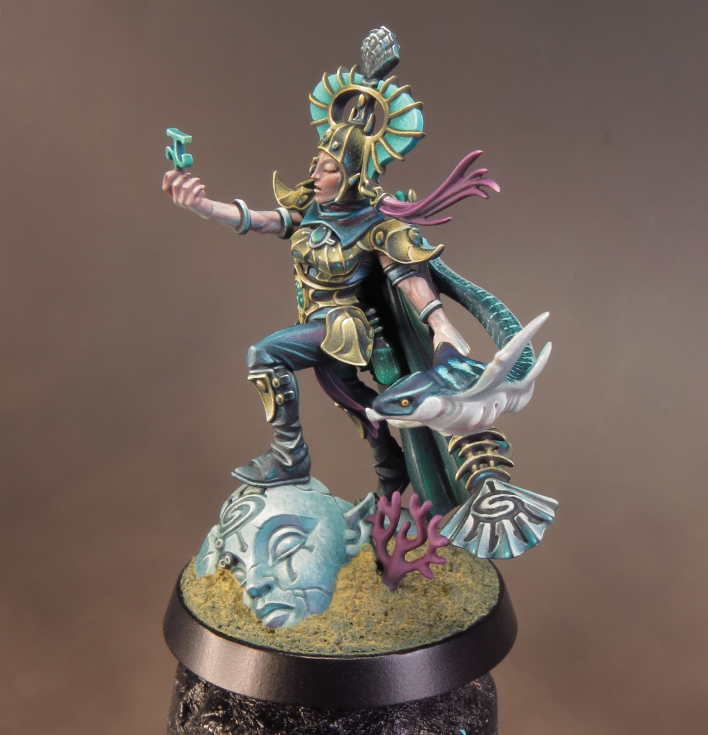 The blues and greens have been used in varying proportions over the entire model but especially on the cloak, statuary, costume and the fish. The foundation of the blue/green is a mix of Scale Colour Boreal Tree Green and Navy Blue. This creates a dark but extremely saturated hue. To lighten and brighten this mix I’ve used a combination of various blue and turquoise hues in my mid-tones. It’s worth mentioning that many blue and green paints have very strong pigments that can easily overpower a mix. When using these colours proceed with caution until you can see how they behave. This sounds like a contradiction in terms as gold is usually thought of as a warm colour. 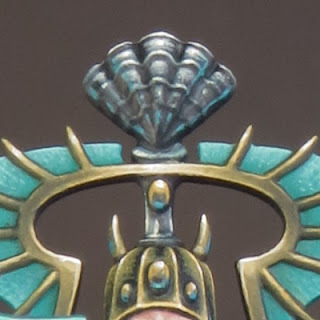 However, the gold I am using on my Tidecaster has a comparatively cool hue. This is achieved by the combination of black and yellow and it results in an olive green mid-tone. This has a far colder hue than a gold with brown mid-tones. Cold gold fits well with the cold blue/green cast of my overall colour palette. It also helps to create the darker, more sinister, feel I am after. In addition to a cool hue I wanted my gold to utilise an extreme range of tones going from pure black to pure white. 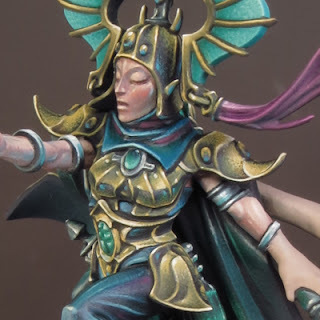 This is by way of an experiment because I’ve never used such a strong tonal contrast in my NMM before. It also helps to create a hard and harsh feel to my gold reinforcing the overall atmosphere. 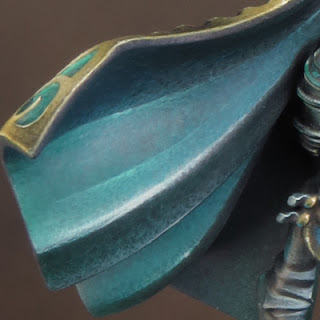 All of the metalics on the Tidecaster feature tiny blue reflection points in the shadows. These blue accents bring colour contrast to the otherwise monochromatic metals. They also unite the metalics with the colour palette suggesting the cold light of the overall environment. 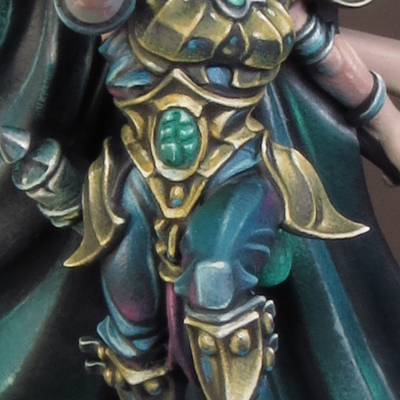 I’ve used black shadows rather than my global shade colour for the gold armour in order to avoid the mid-tones becoming too saturated a green tone. 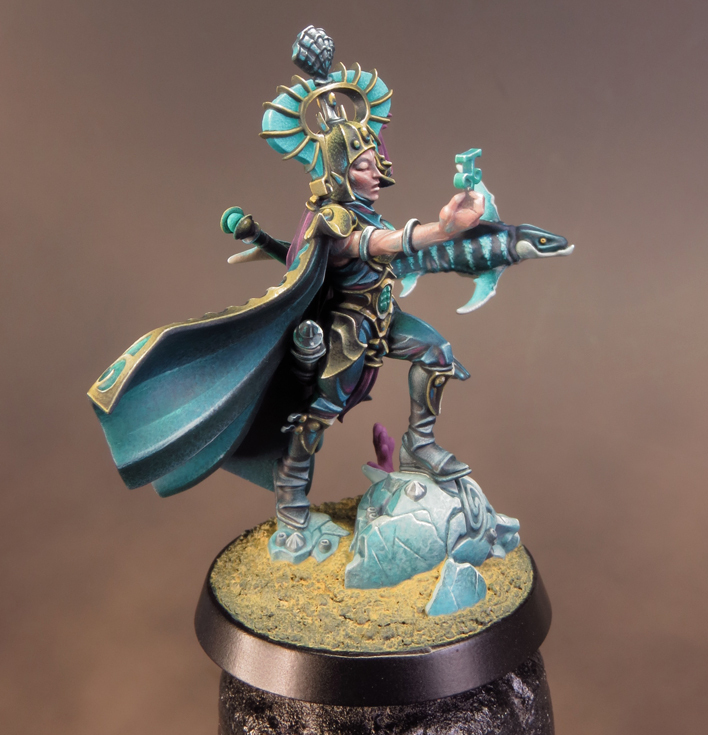 Extreme Highlights: Scale Colour Fantasy and Games – Purity White. The flesh tones are the warmest part of the colour palette but even these have been cooled down to reflect the undersea feel. I’ve used my usual ‘pale human’ flesh tone palette but I’ve left out any yellow tones. The theory being that the cool (blueish) light source will filter out the yellow tones. 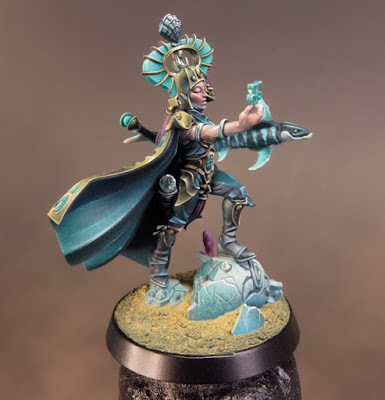 The final colour in my Tidecaster’s palette is purple. This serves as a spot colour to bring a stronger contrast to the yellow and blues. I might have chosen red for this but purple fits better with the overall cool palette. The purple I’ve use is Liche Purple (I found an old pot in the back of my draw) lightened with Flayed One Flesh and darkened with the global shade colour.